Hello ladies, come on in, warm your hands and feet and let me take that wet coat from you. The grey days have arrived and we all need something hot and comforting to warm up with. I have been cooking for you, some true and hearty soup to warm your soul. 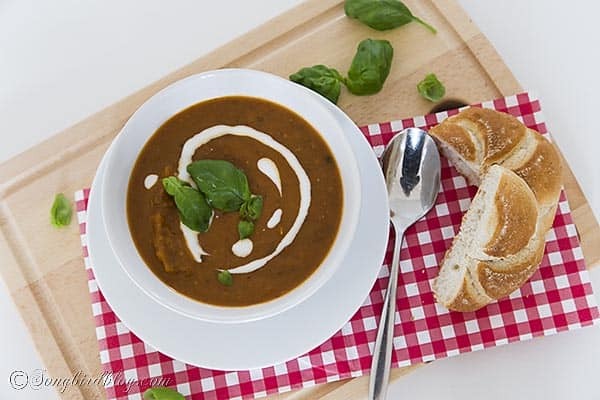 You know that in this house recipes only get the seal of approval if ‘you can taste the love’ , and let me assure you, you will taste the love with this roasted vegetable soup. And it is as easy as one, to three…. So do take a seat and let me warm you with a cup of this healthy, and yummy soup while I share the recipe with you. This is one of those recipes that is very forgiving. You can use up most any veggie that has been lying in your fridge for too long. Since all of the vegetables are going in the oven to be roasted they all will add lots of flavor to the soup, no matter how they looked. No need for professional knife skills either. Just chop them up in big chunks. Drizzle oil over them and roast them in the oven. While they are roasting pour yourself a cup of hot tea, or a glass of wine, whatever means comfort to you most. Added benefit is that the oven will warm up the kitchen nice and toasty too. This is my go-to soup recipe. It is wonderful plain just as is. It also is a super base to make more fancy soups or even sauces. And if you have kids, don’t tell them how many vegetables are hiding inside, and they will eat it as if it were ice cream (well sort off…). * Chop up a mixture of vegetables in large chunks. I will always add: onions, garlic, bell pepper, aubergine and tomatoes. I’ll use pumpkin, zucchini, carrots and beets if I have them. * Spread them out in a large oven dish. Sprinkle with a couple of tbs of olive oil. * Roast in a hot oven until brown and almost crispy (not burned though so keep an eye on them from time to time). * Put vegetables in a cooking pot, add enough fluid to let the vegetables swim, but not drown. You can use any liquid, I usually go for a mixture of broth and a can of tomato pieces. Homemade broth is golden but instant made from a cube works too. * This is also a good time to add a bouquet garni. It will make the soup taste like heavenly love. But if you don’t have any fresh herbs a couple of tbs of mixed dry herbs will do the trick. * Let simmer until all flavors are well combined and the soup is nice and hot. * Puree in a blender or use a submersion blender. * Add a topping (or two). Enjoy! Stay warm and stay happy! Sounds delicious! Soup on a winter’s day is the BEST. Roasting vegetables is the best, best way to go. Yesterday I roasted Brussel sprouts and mushrooms, green beans and some sweet potatoes for Thanksgiving. I also cooked some acorn squash halves. I adore broccoli and asperagus roasted. This soup sounds divinge, thanks for sharing the idea.